If a physical object exists in this world, there’s a good chance some startup is trying to make it more connected. Living in 2016 means living in a world where your umbrella, egg tray, or tampon can sync with that miniature computer in your pocket. Toothbrushes are no exception. 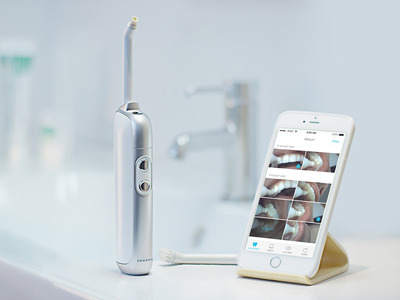 We’ve seen the likes of Oral-B use smartphone apps and built-in motion sensors to (purportedly) make your cleaning more efficient, but a Chicago-based company called Onvi is taking things a step further by putting a video camera within the toothbrush itself. That brush, called the Prophix, can then take 10-megapixel photos and stream 1080p video of the inside of your mouth, sending it all to the requisite companion app over Bluetooth and WiFi. Apart from giving you a very intimate view of dinner, the idea is to help you better see which spots of your clickers you might be missing on a regular basis. As Engadget notes, the Prophix’s brush can be swapped out with three included attachments: There’s a rubber tip for your gums, a prophy cup for more involved cleaning, and a small mirror. A plaque-fighting rubber scaler will be sold separately. Onvi aims to ship the Prophix in the first quarter of 2017. The companion app is iOS only for now, but the company says an Android version is in development. The whole thing will set you back $400, though if you’re in the US, you can pre-order now for $100 less. Either of those seems excessive when you consider how bathroom mirrors and human eyeballs still exist. Regardless, if you’re all-in on the internet of everything, or you’re really particular about oral health, here you go.